In 2-quart saucepan, place eggs in single layer; add enough water to cover eggs by 1 inch. Heat to boiling. Immediately remove from heat; cover and let stand 15 minutes. 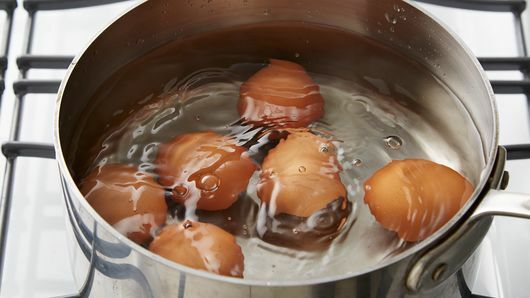 Drain water from eggs; rinse eggs with cold water. 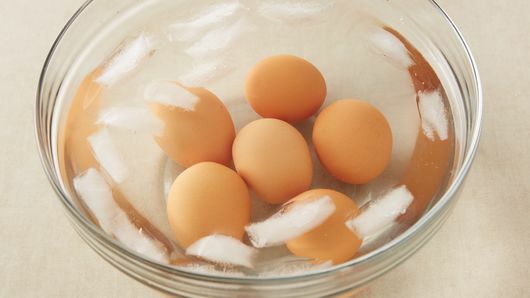 Place eggs in bowl of ice water; let stand 10 minutes. Peel eggs; cut in half lengthwise. Carefully remove yolks; place in small bowl. Mash yolks with fork until smooth. Stir in remaining ingredients except paprika until well blended. Spoon yolk mixture into egg white halves. Sprinkle with paprika. To save time, purchase hard cooked eggs in the refrigerated section of the grocery store. I can eat hardboiled eggs for days, with nary a twitch. In fact, it's my favorite thing about Easter — even better than the candy and ham. Hard-cooked eggs are a wonder: only about 70 calories, portable, and with a wicked shelf life. If you don't bust the shell, they don't even need to be refrigerated. But say you got a little crazy with the festivities, and now you have a dozen psychedelic pink and orange eggs staring you down…what now? Sometimes, though, I don't have the patience for piping everything back into the egg whites, so I just chop the bejeezus out of it all, add some minced pimentos or pickled peppadews, celery and shallots, and make deviled egg sandwiches. I usually put this egg salad on whole grain bread, but I always secretly wish I was eating it on nutritionally devoid white bread instead. 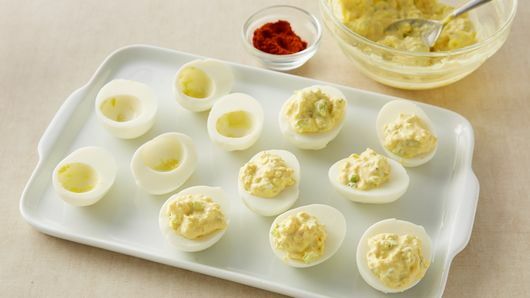 If we're talking about old time-y ways to eat hardboiled eggs, we can't forget about another vintage treat that’s enjoying a comeback: pickled eggs. The pickle brine gives the eggs a wonderful zippy flavor and makes them more toothsome, while allowing you to keep them right on the counter. You can add all sorts of wonderful things to the vinegar, too: turmeric with mustard seeds, chiles and onions are a lovely yellow; beet juice with ginger and peppercorns are a gorgeous fuchsia (use the liquid from boiling beets or the juice from canned beets). The longer they sit in their brine, the stronger the colors and flavors will be. These go great in a lunch box with some brown bread and cheese. They can also jazz up a salad when sliced onto mixed greens (add slivered ham for a zhuzhed-up chef's salad or green beans and anchovies for Salade Niçoise). 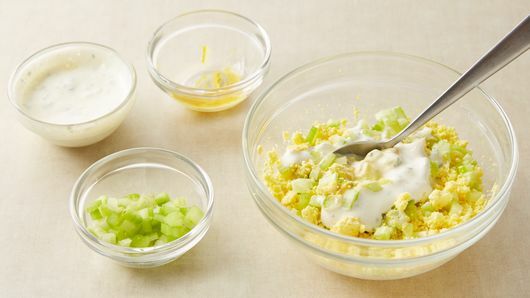 And they are obviously amazing chopped into egg salad—just skip the mustard and add mustard powder instead so you don't overload on the vinegar. If you want to go a totally different direction with hardboiled eggs, make German green sauce (Grüne Soße) by pureeing and sieving the eggs and mixing with sour cream or crème fraîche and a handful of very finely chopped herbs, such as parsley, dill, chives, chervil, cress, borage, shallots and sorrel. Green sauce is traditionally served cold with boiled potatoes, more hard boiled eggs, beef brisket (or schnitzel) and hard cider. Farmers' markets in Frankfurt and Kassel sell little bundles of the green sauce herbs all together in pretty paper packages. I bet it'd be a toe-curl on a roast beef sandwich or, if you're really kooky, a schnitzelwich. 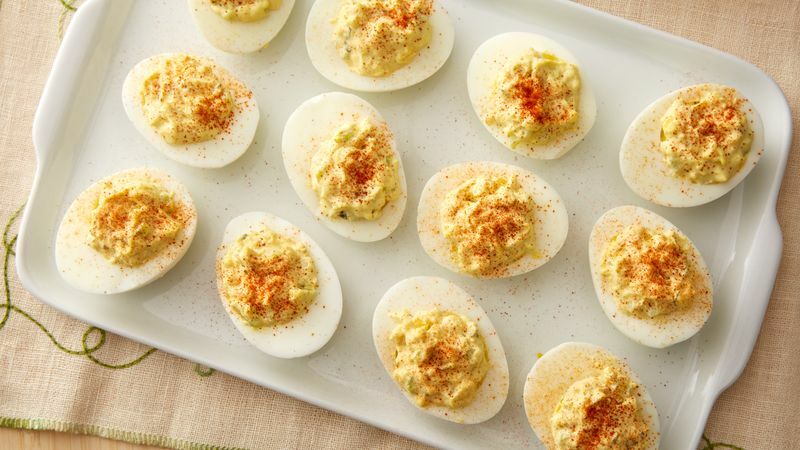 Spring may be for chickens, but we can enjoy hardboiled eggs any time. Who cares which came first, anyway?